For pre-emergent weed control in established lucerne, wheat, faba bean, chickpea, field pea and along fencelines and non-crop boundary areas; and to improve brown-out and weed control with knockdown herbicides as per the label. Terrain 500 WG is a unique and versatile herbicide now with new pre-em registrations in pulse crops and wheat – plus a revamped and improved formulation. 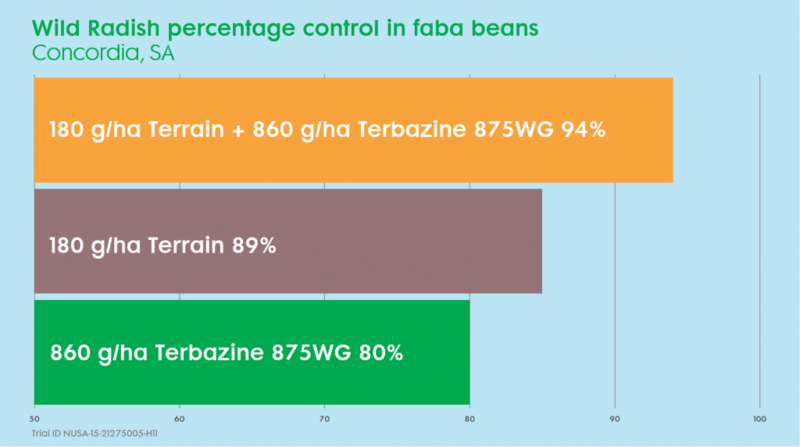 Use Terrain and Terbazine as a tank mix for robust broadleaf weed control in faba beans – the results speak for themselves.